The Jug Drum or ghatam is a percussion instrument, used in the Carnatic music of South India. 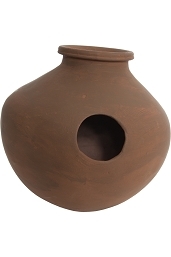 Its analogue in Rajasthan is known as madga and pani mataqa (water jug). It is an earthenware pot; the artist uses the fingers, thumbs, palms, and heels of the hands to strike the outer surface of the ghatam. An airy low-pitch bass sound, called gumki, is created by hitting the mouth of the pot with an open hand. The artist sometimes presses the mouth of the pot against their bare belly, which deepens the tone of the bass stroke, and is another way to produce the "gumki" sound. Different tones can be produced by hitting different areas of the pot with different parts of the hands. The ghatam usually accompanies a mridangam. Although the ghatam is the same shape as an ordinary Indian domestic clay pot, it is made specifically to be played as an instrument. The tone of the pot must be good and the walls should be of even thickness all around to produce an even tone. In fact, there are two types of ghatams: Madras and Manamadurai. The Madras ghatam is a light pot which requires less force to play, thus is suited for extended fast patterns. 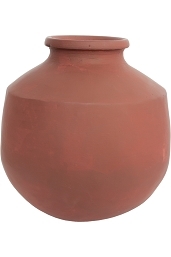 The Manamadurai ghatam is a heavy, thick pot with tiny shards of brass mixed into the clay. This type of ghatam is harder to play but produces a sharp metallic ringing sound which is favored by some players.